Sophia Wong Boccio, 王曉菲, was born and raised in Hong Kong by parents who were part of Hong Kong’s film industry from the 1950’s through the 70’s. Her father (Wong Tsao-she, or Wang Zhao-xi 王朝䂀 - See profile article below) was an award-winning editor with the Motion Picture and General Investment Co.Ltd, (國際電影懋業有限公司, MP & GI/電懋 in short) later reorganized as Cathay Organization (HK) Ltd. (國泰機構(香港)(一九六五)有限公司), and her mother (Yu Wan-fei, 余婉菲), an actress with Sil-Metropole Organization Ltd. (銀都機構有限公司) Growing up “on the sets” of these film studios, Sophia became both interested in, and an advocate of, Asian film. Sophia’s business career first took her to China where she spent almost a decade working for Marc Rich & Co., a large Swiss multinational corporation. As Managing Director of its Hong Kong and Beijing offices, Sophia was responsible for over $400 Million (U.S.) in annual trading activity. In the early 1990’s, while working as the Beijing-based Country Director of a U.S. agribusiness trade association, Sophia launched a SOPHIA’S CHOICE movie series in Beijing, setting the stage for this current endeavor. In collaboration with the China Film Export & Import Corp., SOPHIA’S CHOICE brought Chinese films and cultural exchange with the films’ actors and directors to Beijing’s expatriate and diplomatic community. In the late-1990’s, during a two-year residency in Sydney, Australia, Sophia curated two independent retrospective Chinese and Hong Kong film festivals on behalf of the Hong Kong Economic & Trade Office and the People’s Republic of China Consulate in Sydney. In 1999, Sophia also became the Hong Kong Consultant for Italy’s Udine Far East Film Festival (FEFF) and continues to support the festival as the official Cantonese (and also Mandarin) Chinese translator for the festival’s VIP guests. In 2000, Sophia relocated to Chicago with her husband, Michael, and they have made Chicago their permanent home. Inspired by Chicago’s diverse and vibrant culture, Sophia applied her business acumen to supporting Chicago’s arts community as Managing Director of the Chicago International Film Festival (2000-2007), Executive Director of Fulcrum Point New Music Project (2007-2013), and Managing Director of Redmoon Theater (2013-2014). supporting Chicago as one of the world’s diversified arts and culture capitals. 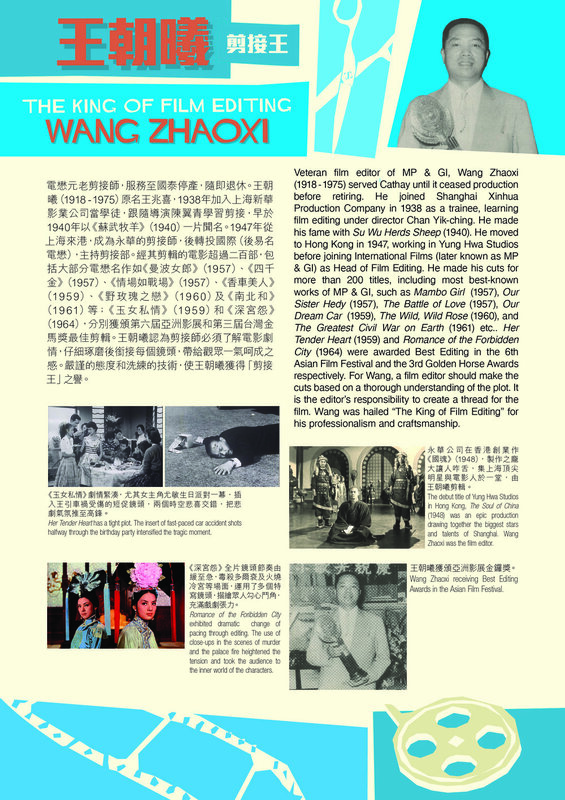 Below was one of the profile exhibited items presented by Hong Kong Film Archive in 2015 paying tribute to the 80th Anniversary of Cathay Organization (HK) Ltd.